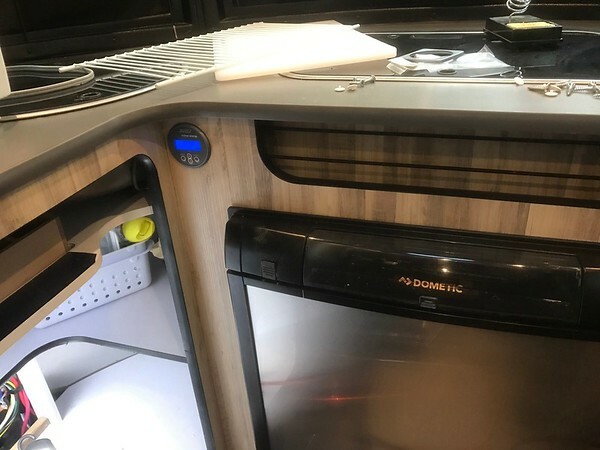 Today I finished installing a Victron BMV-712 Smart battery monitor in my Airstream Base Camp. I'm pretty happy with it and thought I would share where I fit the components and a few general comments. 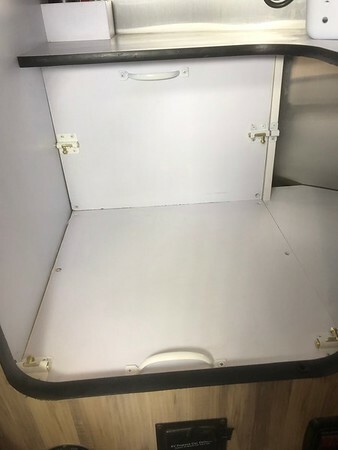 I modified the access to the battery compartment and the rear wiring panel under the sink. Here are my batteries that came with the Base Camp. 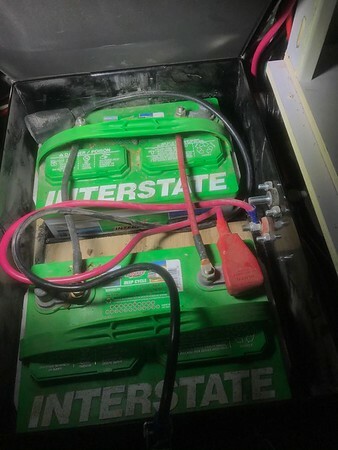 Two Interstate SRM-24 batteries wired in parallel. The batteries are in a closed metal box with a vent tube for gasses. Nice. The leads are passed through the box via insulated stubs. I considered mounting the Victron shunt in the box because it's supposed to be close to the battery but I didn't want to cut more holes for the wires. Then I considered mounting the unit on the outside of the box which might have worked but it was a tight fit without removing the batteries and maybe the box. After much debate I ended mounting the shunt unit on the back board near the power distribution blocks. 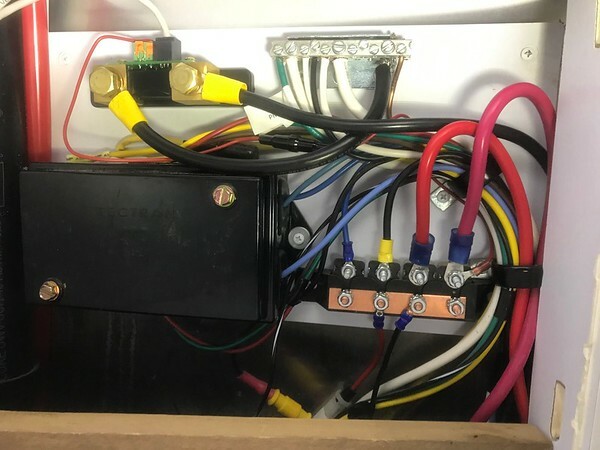 There is a small red wire that goes from the terminal block on the shunt that is routed in the wire bundle down to the terminal with the rightmost big red wire. That wire goes to the +side of the battery box. The whitish wire coming out of the shunt unit is a cat 5 cable that goes to the monitoring unit. NOTE: It is a cat5 cable but uses an RJ11 connector NOT your standard RJ45 connector. I tried using a shorter cable I had with a 6-wire RJ11 connector and it didn't work. Stick with the cable they supply even though it's really long. Here's where I ended up putting the monitor. I put it here because it was EASY to drill the holes I needed and run the wires plus it's relatively easy to see. I used a 1/2" paddle bit in my impact driver (because it's smaller) and drilled from the cubby hole above the fridge towards the sink for the cat5 wire. It was easy to run the wire under the sink and route it to the shunt. I used a hole saw for the big hole. I had to keep if far enough to the left so I didn't have interference with the screws holding the rubber bands in the cubby. The most important parameter for programming the unit is the Battery Capacity. I'll save everyone hours and hours of online research..... for the Interstate SRM-24 battery the c20 rating is 85ah and for two batteries it's 170ah. Enter 170 as the Battery Capacity. Lastly, for those who say the shunt should be closer to the battery I've concluded my mounting position works just fine. The BMV-712 is a cool gadget and has an app for my phone to monitor the charge state of the battery and real time current draw. I have a big trip coming up in May with mostly boondocking stops. I'll let you know how it works. I hope this helps someone down the line. The magic cable to the BMV-712 is technically an RJ-12 ( RJ-11 has 4 wires, the RJ-12 is the same size with 6 wires). The 712 does work with bog standard RJ-12 cables from Amazon. The gotcha with the cables is the way the connectors go on. The cable normally used for this is flat,. That makes it easy to strip and also easy to see what they did with the connectors. If you lay the cable down on a table, one connector is "tab up" and the other connector is "tab down". Yes, that's weird. Probably better to show with a picture, but all my stuff is buried at the moment.